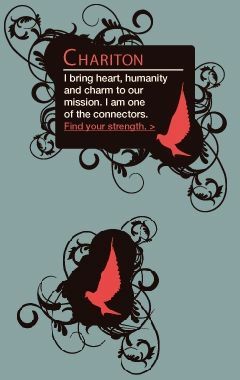 I bring heart, humanity and charm to our mission. I am one of the connectors. Kai geeked out a little bit for us. Using the latest omphaputer display, he made a map for us showing the current coverage of our omphalos network. Look at all that empty space we haven't covered yet! According to the Lost Ring Codex, our network has to cover 85% of the earth's surface. We are so TOTALLY not covering 85% of the earth's surface yet. "Now obviously" -- Kai says in his most sofia voice -- "We aren't quite as bad off as this flat projection makes it look. That arctic and antarctic space represents a much smaller percentage of overall earth surface than this projection makes it look. But we still have to get better northern coverage. Judging from this map, an omph knot anywhere in Alaska and anywhere in Scandinavia (the more north, the better) would be absolutely ideal. With those two spots add to the network, we WILL be up to about 85% coverage." So who is working on this mission? Chariton, can you find allies for us? Dikaoisune, can you lead the charge on this to make sure it actually happens? "We still need a few more city captains! There's barely enough time to get a trackstick from Kai before August 8th, so GO GO GO GO! Submit a labyrinth design to Eli at thelostgames@gmail.com and ask Kai for a trackstick at kaitown@gmail.com! If YOU want to experience the POWER of the OMPHALOS, then you have to join our global network of city captains. Let's go, we have just over 2 and a half weeks to go!" James has agreed to help us get our omph strength up. In return, he wants to get promoted up Theo's ranks. It's not so hard -- according to his boss Renata, he just needs 27 new Theo recruits from all over the world. The new recruits need to take the Oath of Theo on vidoe, and to complete an un-initiation mission. Email James at themembersoftheo@gmail.com to get your uninitiation instructions and the text of the oath. I know, I know. Some of us still think Theo members are the bad guys. Trust me, it's no BFF alliance. But Kai thinks it's for the best. And Kai, I trust. But for now, because we all want to get home and save the worlds, we're in a kind of alliance... I guess. So chariton and thumos, this is all up to you. Can you marshall 27 people brave enough to join forces with thumos? Chariton and Thumos, your strengths combined can give us the human insight and courage we need to play with, or against, Theo. According to The Art of War, by Sun Tzu: "If you know the enemy and know yourself, you need not fear the result of a hundred battles. If you know yourself but not your enemy, for every victory gained you will also suffer a defeat. If you know neither the enemy nor yourself, you will succumb in every battle." Many of us consider ourselves enemies of Theo -- despite that fact that we don't understand him (them? it?) very well. Our job is to understand the enemy so as to defeat the enemy. Meanwhile perhaps some other sect of us considers ourselves potential allies. Their job is to understand the enemy so as to cooperate with the enemy. Both roads may be worth taking, at least for part of our journey. We have few clues to Theo's intentions. However, a friend of MeiHui's named Thermantia has recently reached out to some of us with what seems to be an important clue. Perhaps if you are interested in learning more about Theo and its purposes, you would enjoy the historical information at this website, which I have recently stumbled upon. It is more learned than it would appear at first glance. Chariton, we need your strength to get Eli Hunt's help again. This mission is solved when someone gets him to write back with news of where he has been, and what he's currently investigating! Chariton, use your charm to get someone out to the Shin Old Tea House! We don't have many agonothetai in Seoul, but you can help us find some. We need to know what's in the next chapter of The Lost Ring Codex. There's a secret document waiting for us, and we have to get it! Chariton, your strength can help everyone stay connected. Six of us -- Ariadne, Diego, Markus, Noriko, Meihui, and Lucie -- woke up in labyrinths with amnesia, and with the same "find the lost ring" tattoo. Two more of us -- Larissa and Monica -- have evidence that all of this has happened before. We're "allies", because we know we share the same mission. But we don't speak the same language. We may be in the same situation, but our stories and theories are different! So please help us work together, and help our friends talk to each other. What are they thinking? What are they doing? Keep the lines of communication open for us! Chariton, you can help us start preparing for the training labyrinths. Chapter 4 of the Lost Ring Codex says that "chariton" is responsible for choosing locations for the training labyrinths. There's almost no doubt now -- the labyrinth must be the lost sport of Olympia. We still don't know exactly how to run a training labyrinth. But is there any doubt that we will need to run some? Hopefully, new chapters will teach us the rules of the game. And in the meantime, thanks to the codex, we know exactly how much space we need and the kinds of locations that help us hide the labyrinths in plain sight. Help us start to plan locations for labyrinths. Where would you run a training labyrinth near YOU? This page was last modified 01:45, 28 April 2012. This page has been accessed 20,551 times.